The StreamScapes Ilen Project, which has been produced with support from West Cork Community Development, represents the ideal in StreamScapes methodology. 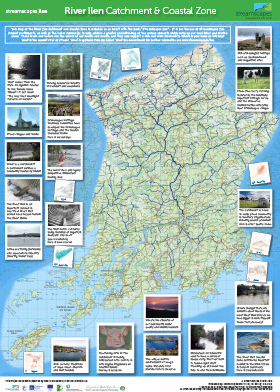 A small critical mass of an entire River Catchment & Coastal Zone’s population has been directly engaged in theoretical and practical lessons in Aquatic & Biodiversity education, supported by a dedicated Project Booklet (including insert map of the River Ilen Catchment & Coastal Zone). The project included a Festival where participants exhibited their project work and celebrated their aquatic and biodiversity resources (see Photo Gallery Link below). 807 participants so far and counting! An introduction to the water cycle, information on the rich Biodiversity (including humans!) which a healthy River Ilen supports and it furthermore contains useful information on how we impact upon water quality and how we may achieve ‘Best Practice’ in pursuit of livelihood, recreation, and domestic management.